Grilled vegetables are an easy way to bump up the nutrient density of your go-to BBQ meal, but sometimes more veggies end up slipping through the cracks than onto your plate. That’s why we recommend Grill Clips to help hold together your produce, and ensure they get a safe transport from grill to table. Grill clips guarantee that all of your vegetables, even those slender asparagus, stay on the grill from start to finish. They hold all of your thin and delicate veggies together, making that mid-cook flip easier and more efficient. Since they are stainless steel, grill clips are durable and can withstand high heat. Their zig-zag edges prevent the clips from pressing down too hard on your vegetables, leaving them mark free. Grill clips are dishwasher safe, so clean up is that much easier. 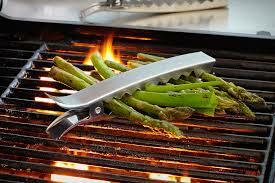 Most grill clips come in a set of four, and work perfectly with asparagus, zucchini, carrots, and more. Buy a pair now, and get grilling with our grilled shrimp, asparagus, and avocado salad.